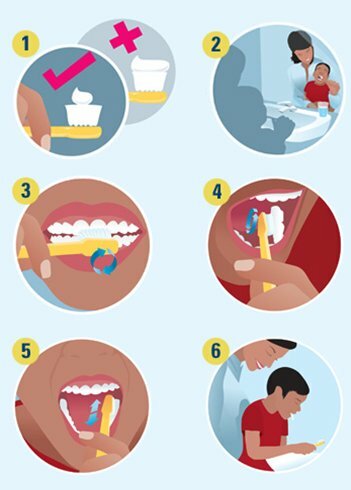 You can introduce a soft children’s toothbrush from 12 months (earlier if tolerated by the infant) and just use water. We recommend you start using toothpaste from 18 months. Brush your child's teeth at least twice a day (morning and before bed) to remove plaque that can cause infant infant tooth decay and gum disease. Smear a pea-sized amount of low-flouride toothpaste onto a soft children's toothbrush. Sit the child in your lap, facing away from you, or stand behind taller children. Tilt the child's head back against your body so you can see all the surfaces of the teeth. Angle the bristles of the toothbrush towards the gum. Move the brush in gentle circles to clean the outer sides of the teeth and gums. Rush in gentle circles on the inside of the teeth and gums. Brush back and forward on the chewing surface of the teeth. Toothbrushes should be replaced every 3-4 months, or when the bristles get worn or frayed. How to brush charts are also available in Arabic, Chinese, Somali, Turkish or Vietnamese from our Translated materials page.